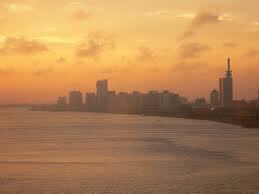 Lagos city SW Nigeria, on the Gulf of Guinea. It comprises the island of Lagos. Lagos is Nigeria's largest city, its administrative and economic centre, and its chief port. Industries include rail road repair, motor vehicle assembly, food processing, and the manufacture of metal products, textiles, beverages, chemicals, pharmaceuticals, etc. Lagos is one of Africa’s largest and busiest cities with a population in excess of 14 million people. Until 1991, Lagos was Nigeria’s capital and it still remains its most important city in terms of its economy and culture. Lagos started life as a small Yoruba settlement and port – the city itself now covers several large islands spread over an enormous lagoon. In the 1400s, the Portuguese used Lagos as a trading post for the slave trade until the British put a stop to it in the late 1800s and took control of the local trade and industry. In 1960, Nigeria gained its independence and the city of Lagos started to boom. Direct flights to Lagos are usually popular as they can save invaluable travelling time and are very convenient. Try Virgin Atlantic and British Airways for direct flights from the UK. Lagos is now one of the world’s fastest growing cities with a cosmopolitan population, a thriving live music scene, chaotic and traffic jammed roads, high pollution and infamously high levels of crime. Head to the National Museum to see the brasses from Benin City, the Nok Terracottas and some impressive royal crowns. There is also a small craft village within the museum with lovely traditional crafts and woodcarvings which can be purchased at a fixed price. Close to Lagos and well worth a visit is the Lekki Conservation Centre – this wetland reserve has raised walkways for viewing the local wildlife which includes monkeys, crocodiles and a great variety of bird life. As with most destinations, flight prices will usually rise as you head towards your departure date and the seats on the planes start to book up so book in advance for the cheapest flights. Cheap flights to Lagos, Nigeria can be found throughout the year however for the best deals try and travel during the less busy times of the year for the best choice of low cost flights. Great prices can also be found on lastminute flights if you're using our flight comparison search which compares over 500 airlines and travel partners. Lagos has a tropical savanna climate that is similar to that of the rest of southern Nigeria. There are two rainy seasons, with the heaviest rains falling from April to July and a weaker rainy season in October and November. There is a brief relatively dry spell in August and September and a longer dry season from December to March. Monthly rainfall between May and July averages over 400 mm, while in August and September it is down to 200 mm and in December as low as 25 mm.